Do you dare to explore? Paris Gothique is the definitive guide to Paris for All for One: Regime Diabolique. This supplement includes information on all the important figures, places, and secret societies in France's capital city. Also included is information on Parisian streets, architecture, and other aspects of everyday life. 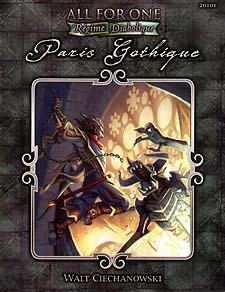 In short, Paris Gothique provides the Game Master with everything needed to run swashbuckling adventures in the city with a good dose of horror if required. Contents of the book include detailed information and locations in central Paris, how to set up adventures, new personalities and secret societies, and of course new monsters and lackeys. Paris Gothique requires the All for One: Regime Diabolique RPG. All for One: Regime Diabolique is the award-winning musketeer roleplaying game from Triple Ace Games.